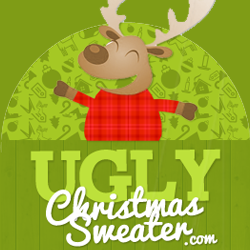 Will you be attending an ugly sweater party in Detroit? Detroit has four professional sports teams and lots of tacky Xmas sweaters to go along with them. You should have no trouble finding a sports related ugly sweater. If you’re not a sports fan, there are many other Detroit shirts that qualify as ugly enough to wear to a tacky sweater party. Lions fans can browse these lovely, tacky sweaters and decide what degree of ugly they’d like for their party attire. There’s even a sweater vest which would fit right in to the ugly party scene. Let’s see what ugly Xmas sweaters we can find for the City of Champions! If you’re attending an ugly sweater party in Detroit, you might be looking for a Detroit Lions sweater. We could find only one sweater for the Detroit Pistons basketball team so, hope this is ugly enough for you! Did you know that the Pistons are formerly from Fort Wayne and that they recently celebrated their 50th anniversary (2007-2008)? This rather loud Detroit Pistons sweater would be appropriate attire for an Ugly Sweater Partyi. If the Detroit Tigers is your team then there are some choices here for you. According to Wikipedia “They are the oldest continuous one-name, one-city franchise in the American League.” Done in the snappy orange and black colors of the Detroit Tigers team. Are you a Red Wings fan? There are some cool but ugly Xmas sweaters from which to make your choice. Red and white like the colors of the team, any of these tacky sweaters would be great for a party. Any Detroit hockey fans out there? I want one of those Red Wings sweaters. Detroit Hockey is the best!